ATTACK, attack, attack, was the policy for St. Tiernan’s seven-strong A3 National Championships team in Mayo on Sunday – and it nearly paid off. Last year’s team secured the team championship prize, Martin Vereker finishing fourth, John McGettigan ninth and Richie Gallagher 25th. McGettigan and Gallagher lined up once again, with John Malone and James Quinn returning and James Kelly, Barry Walsh and Adam Greally joining them – and all was looking rosy at halfway. McGettigan was in a break with two others and more than a two-minute gap. There were two further riders 20 seconds up the road and bridging to them looked a winning plan. 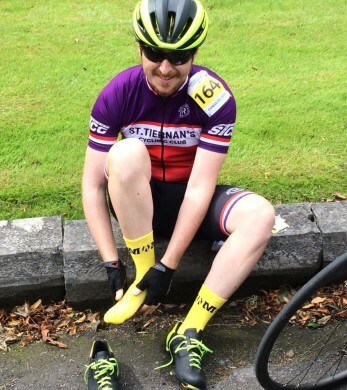 Yellow socks in honour of the late Martin Vereker, 4th in last year’s champs. However, it was not to be. 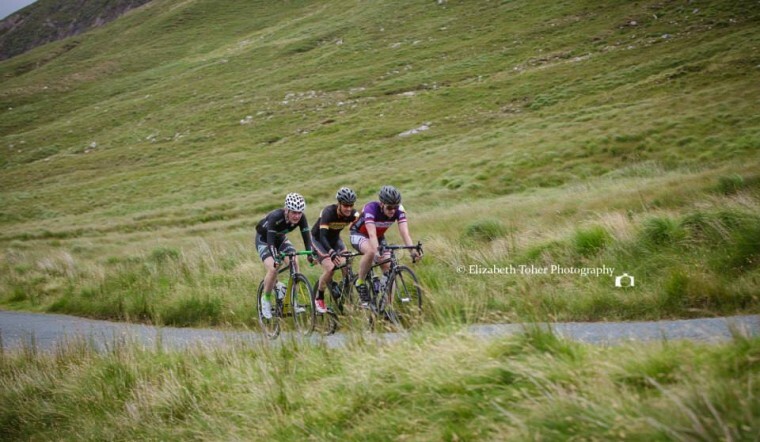 Like every other break, they were reeled in and it came down to a 60km bunch sprint, which Quinn attacked to secure sixth and second place for St. Tiernan’s in the team competition, behind neighbours Orwell Wheelers. St. Tiernan’s Racing Manager, Gallagher, added: “Thanks Fergal May and Michael Oliver Moran for doing support for us today. Great having you both there. “Savage rides by all the lads with STCC well-represented in every break of the day. Further pushing the opinion that the team was hard-done-by was the winners, Orwell Wheelers. Rider Bernard English said: “Respect to all the Tiernan’s lads in Cong. Ye are as tough as nails and rode aggressively all day. Lady luck was our side today, no doubt ye will be back next year. 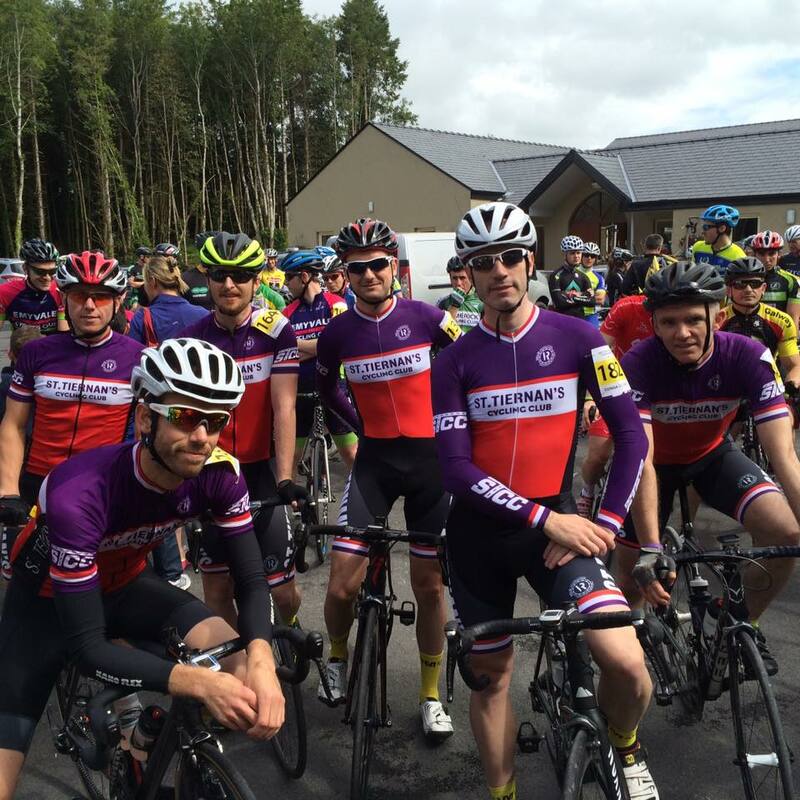 Chapeau from all the Orwell lads.” The race was won by Killarney’s Richard Maes. No Replies to "A3s pipped by Orwell at National Champs"